This page contains many links and references to the research and articles which I think help people understand as well as possible what’s really going on when we use our screens (phones, tablets, computers etc). It also includes the FREE Life Online Parent Pack. Just because I refer to research does not mean I think it’s fully proven. Research always needs to be repeated and ideally be part of a meta-study before we should rely on it. However, these resources are as robust as possible and fit what we know from elsewhere. We can’t always afford to wait for “proof” before putting into practice what feel like sensible policies. My book The Teenage Guide to Life Online brings it all together and explains the nuances honestly. My core belief – which I back up with logic, science and robust argument – is that banning phones is not generally the answer. Learning to self-regulate and use them well is the answer. And for that we first have to understand why we should, not by listening to inflammatory media headlines but by properly understanding what’s going on. I give talks on this subject, as well as many other aspects of well-being for teenagers and adults. Do see the Speaking section of my site. NB I do know that “social media” should be plural but I have given up and will use it as though it is singular… However, I’m a bit inconsistent and in speech I tend to slip into correct plural usage. I created the Life Online Parent Pack for parents everywhere, to help you understand as quickly and well as possible what the issues, science and strategies are. It is completely free (though Copyright laws apply). “INTRODUCTION_LOPP” – contains important general points – read it first. It also contains a link to a Powerpoint presentation I have created for you. “TIPS_SCREENTIME” – an A4 sheet of tips for adults and young people. You can print or share this in any way you like*. “PLEDGE_LOPP”, an ONLINE WELL-BEING PLEDGE to discuss with your family. When you’ve talked it through, draw up your own pledge, which might be the same or different. “PCARD_LifeOnline” – a postcard with four of the best tips I have – you can replicate this in any way you like: print it, share it, embed it in a Powerpoint* etc. 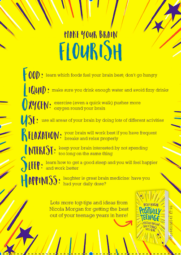 PCARD_FLOURISH” – I’ve added a FLOURISH card, with core principles from my book, Positively Teenage. Positively Teenage contains advice about healthy online and offline living, so it’s relevant. If you choose nothing else, do use this A4 sheet of tips: TIPS_SCREENTIME. And I have created a basic Powerpoint presentation for you to look at. (NB In my talks, I cover the same topics but my talks obviously go into much more detail and cover more. This is NOT a duplication of the presentations I do in schools – I created it especially to make sense without my presence.) See my slideshare page here and find the presentation called Life Online Parent Pack Powerpoint. Is social media affecting my GCSEs? http://blogs.lse.ac.uk/parenting4digitalfuture/ – really good blog from the LSE, very detailed, balanced and science-based. There’s a weekly newsletter bringing up-to-date resources. A very useful Parent’s Guide to Online Safety and Security, from Best VPN. I really like this: it’s split into different headings for different ages and it’s very practical and solid. Some of these books hold a one-sided position. Even when authors are experienced researchers, they may fall into the trap of selecting only what supports their view. So, caution! The rise of social media has made us the most connected society to date but coincided with apparent decline in mental health. Brilliant piece by John Lanchester in LRB. “Attached to tech and paying a price”, NY Times from 2010 but robust and detailed. Multi-tasking and digital distraction. Internet “addiction” or “use disorder” – www.nature.com/articles/srep45064 – actually reassuring. Yes, screens can lead to over-use and sometimes this can be classed as addiction, but it’s a softer addiction than substance misuse and more easily dealt with. The research is by Qinghua He and Ofir Turel. Reclaiming Conversation: The Power Of Talk In A Digital Age by Sherry Turkle (UK-based, tending to be about older teens or young 20s). Turkle in NY Times: “Stop Googling – Let’s Talk”. I think this is a must for parents of teenagers, if you can face being shown that your own phone use may not be helping matters at all! Research showing how conversation is poorer when a phone is present: “Can you connect with me now?” Przybyliski and Weinstein 2012. “Changes in dispositional empathy in American college students over time: a meta-analysis” by Sara Konrath, Edward o’Brien et al in 2011. NB From 2011 so the reported drop in empathy “over 20 years and especially the last ten” can hardly be explained by social media use… What about screens? Computers? Politics? Reported here. And that terrific article by John Lanchester, “You are the product”. Again from Parenting for a Digital Future, For Better or Worse – how does social media affect young people’s wellbeing?, a good analysis of a survey of US teenagers showing that although 15% said social media made them feel worse, 27% reported that being on social media made them feel better. There are useful examples of what the young people said, which I think will give you a good insight into the issues to consider. I’d also suggest that people take less notice of headlines and statistics and more notice of how they actually feel. If you feel that your experiences of using social media do sometimes/often/ever make you feel low, unworthy, anxious and compare yourself negatively with the people you see there, switch off, walk away, do something else. “We want privacy online but our actions say otherwise”. The Organized Mind: Thinking Straight In The Age Of Information Overload by Daniel Levitin, on info deluge, concentration (lack of) and multi-tasking (lack of). Levitin has a great article here explaining the brain bandwidth theory I often talk about: “Welcome to the Internet and the information age – 174 newspapers a day”. “Tiny Distractions Can Double Mistakes”: “Just a three-second distraction, such as glancing at your phone, can divert your attention and double the number of mistakes you make” by Tia Ghose 2013. My post on working while listening to music. “How Has the Internet Reshaped Human Cognition?” by Kep Kee Loh and Ryota Kanai. Using screens/social media a lot does NOT makes people better at multi-tasking. The abstract: “Throughout our evolutionary history, our cognitive systems have been altered by the advent of technological inventions such as primitive tools, spoken language, writing, and arithmetic systems. Thirty years ago, the Internet surfaced as the latest technological invention poised to deeply reshape human cognition. With its multifaceted affordances, the Internet environment has profoundly transformed our thoughts and behaviors. Growing up with Internet technologies, “Digital Natives” gravitate toward “shallow” information processing behaviors characterized by rapid attention shifting and reduced deliberations. They engage in increased multitasking behaviors that are linked to increased distractibility and poor executive control abilities. Digital natives also exhibit higher prevalence of Internet-related addictive behaviors that reflect altered reward-processing and self-control mechanisms. Recent neuroimaging investigations have suggested associations between these Internet-related cognitive impacts and structural changes in the brain. Against mounting apprehension over the Internet’s consequences on our cognitive systems, several researchers have lamented that these concerns were often exaggerated beyond existing scientific evidence. …, we aim to provide an objective overview ….”. The Marshmallow Test: Understanding Self-control And How To Master It by Walter Mischel – with strategies for resisting temptation! Many young people themselves recognise problems of over use. 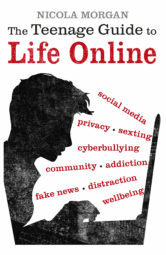 See this from the Growing Up Digital Report: “Many children recognize the symptoms of internet addiction, including losing contact with reality, losing interest in activities, headaches, eye problems, sleep problems, and losing friends.” EU Kids Online: http://eprints.lse.ac.uk/60512/1/EU Kids onlinie III.pdf (Dec 2016). We can use this awareness: the first step to dealing with compulsive behaviour is to recognise the problem and want to stop. Smartphone and social media users of all ages (esp teenagers), please take a very few minutes to complete this survey. And please share widely: the more responses I get, the more relevant the results! Resources gathered for you by Nicola Morgan, expert on teenage brains, stress, well-being and the learning brain, including the role of screens and brain bandwidth on concentration and function.